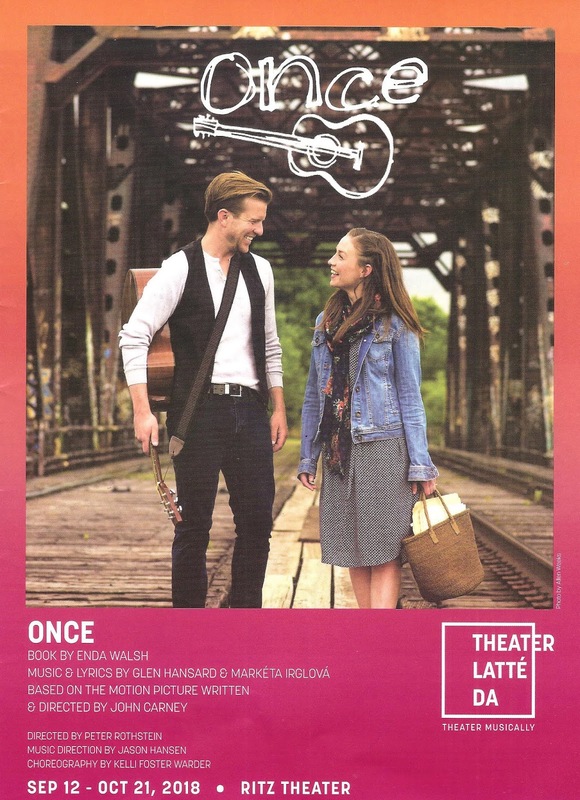 Ever since it became available for regional productions a few years ago, I've been (im)patiently waiting for a #TCTheater company to do Once, the eight-time Tony winning musical based on the Irish indie film that won an Oscar for best song. My (im)patience has finally been rewarded with a production by my favorite company of theater musically that is, in a word, grand. Theater Latte Da used to have a series called "Broadway Re-imagined," but the cool thing about Once is that the original production on Broadway was already re-imagined, at least in terms of what you usually see on a Broadway stage. 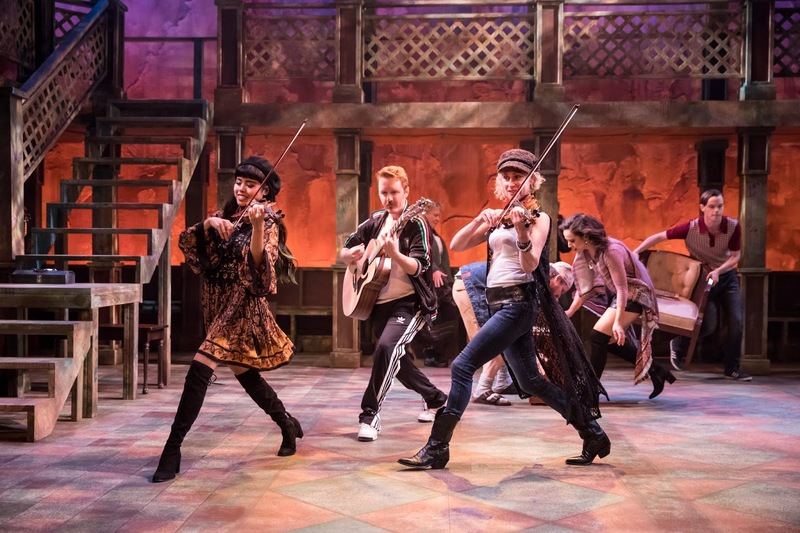 It's a small intimate story lacking the traditional (clichéd) happy ending; it features folk-rock music; and there is no separate orchestra, rather the ensemble also functions as the band in one cohesive celebration of music, love, joy, and pain. So very Irish. Still, Latte Da has managed to put their own unique spin on it and cast 13 multi-talented local performers to create something truly special that will make your heart ache in the best possible way. 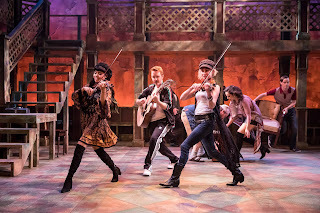 This is my fourth time writing about the musical Once, so I'm not going to tell you again about my love for the movie, Glen Hansard, and Ireland, or my thoughts on the adaptation (you can read all about that here). Although I will share this description of the plot from one of my past posts: "The story is simple and quiet - boy meets girl, boy fixes girl's Hoover, girl encourages boy to record his songs and follow his dreams, boy and girl go on with their separate lives, better for having met one another." It's an atypical love story about an Irish street musician and a young Czech woman who meet when both are at a crossroads in life, and help each other through to the other side. It's a story of connection, music, and community in which not a whole lot happens, except that everyone is changed. In the pivotal roles of the girl and the guy (they are not named), genius director Peter Rothstein has cast Britta Ollmann and Ben Bakken, and I can think of no better #TCTheater actors to play these roles. I knew both were incredibly talented singers and actors, but here they get to show off their musicianship as well (piano and guitar, respectively). Britta is just perfect as the straight-forward, serious, determined girl, and sings, as always, like a dream. Ben has perhaps the most soulful voice in #TCTheater, the kind that can reach right into your chest and rip out your heart, and he applies it well to Glen Hansard's brilliantly passionate and gut-wrenching songs, while embodying all of the emotions, expressed and unexpressed, of the reluctant musician. The two of them have believable chemistry and their duets are absolutely magic. Surrounding the two leads is an 11-person ensemble, including music director Jason Hansen, who play multiple characters and instruments. They're all wonderful in whatever part they're playing, even just sitting on the side of the stage watching, or adding harmonies or instrumentals. Reed Sigmund made me laugh the hardest (as per ushe) as music store owner Billy, followed closely by Jay Albright as the accordion-playing bank manager. Suzanne Warmanen brings warmth and (more) humor as the girl's mother, while Martin L'Herault is lovely as the guy's grieving Da. Musical highlights include Francesca Dawis and Molly Sue McDonald's dueling fiddles, and Matt Riehle and Silas Sellnow playing so many different instruments I lost track. Rounding out the ensemble are Antonio Perez as the girl's Czech friend, and Dan Piering with his cello (plus other instruments). The entire ensemble works and plays well together, displaying a level of trust and comfort with each other, and they sound incredible whether on a spirited instrumental, or an a capella song that will give you chills. Michael Hoover's set is "reminiscent of a train station" (as noted by Peter Rothstein in the program, which as usual contains much interesting dramaturgical information). Characters and scenes move in and out of the space, which includes a second level. Choreographer Kelli Foster Warder has imbued movement into the piece that feels like an extension of the soul of the music. And speaking of music, be sure to get there early. The ensemble begins playing traditional Irish music a half hour before showtime (and there is Guinness at the concession stand in the lobby, natch). I'll leave you with more words I've written about this show in the past, that still hold true. 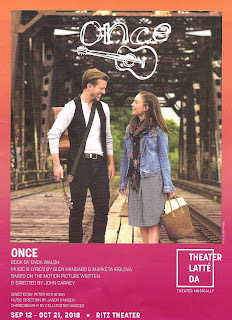 The lovely, funny, moving, and musically rich Once continues at the Ritz Theater in Northeast Minneapolis through October 21. "Unlike what Hollywood and Broadway usually tell us, not everyone gets a happily ever after kind of love, and maybe that's not even the ideal kind of love to strive for. If we're lucky, we get an hour, or a day, or a week-long encounter with someone who changes our life and pushes us forward when we've become "stopped." Maybe that's what life is, a series of moments, encounters, relationships, that might not last a lifetime although their effects do. That's what this story is about, and that's what these two people do for each other. It's a perfect love story, even though it may not end in the way that we're taught to expect. And it's also a love story about Ireland and its rich and unique culture, that the girl describes as "speaking and singing of what it is to be human." 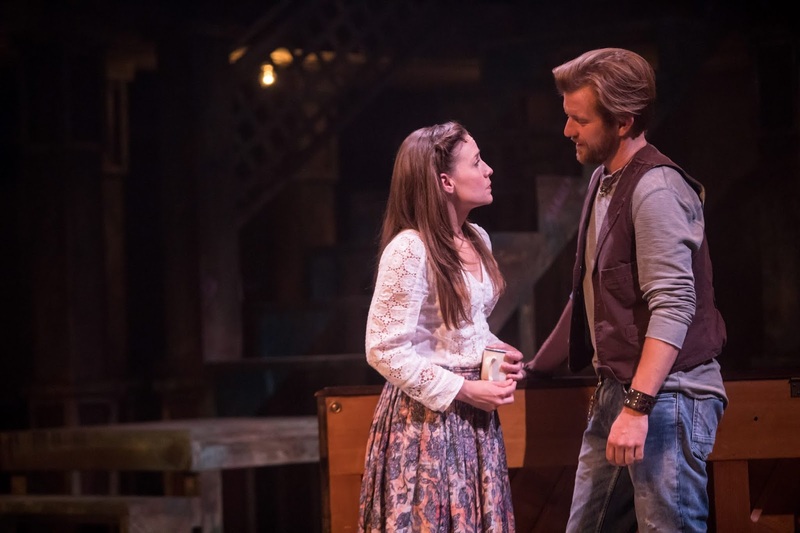 She tells the guy that he has "heart and soul," and this unique music-theater creation has heart and soul in spades, and speaks and sings of what it is to be human, with all the heartbreak, joy, disappointment, passion, connection, difficulties, and wonder it entails."